Fair. Water damage on top edge of pages diminishing through page 40. Moderate cover wear. No writing on text. No highlighting. Solid binding. New. 1599210568. Softcover is heavy, glazed paper. Pages are clean and tight; this is a NEW book. Originally published in 1999, this is the second edition of a perennial favorite among horse folks of all disciplines. Lavishly illustrated with 100+ b/w photographs. 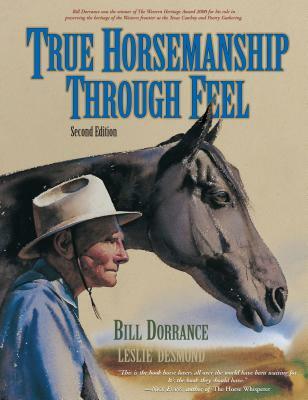 Brothers Tom Dorrance (May 11, 1910-June 11, 2003) and Bill Dorrance (January 19, 1906-July 20, 1999) are considered among the founders of the modern Natural Horsemanship movement. Bill was a legendary livestock rancher and master horseman from Salinas, California. With a background in the Great Basin "Buckaroo" tradition, they promoted natural, gentle methods of horse training, emphasizing "feel" of the horse and observation of its responses to the handler. They had a particularly strong influence on Ray Hunt and Hunt's disciple, Buck Brannaman. Many other natural horsemanship practitioners also claim influence from the Dorrance brothers, including Pat Parelli and others. For all of us who love our horses, and want to attain that true 'oneness' that only comes through listening to your horse, working with them, and being open to all the experiences a horse can offer you, this is a 'must have' book. Index. Oversized, 4#. ; B & W illustrations; 1 x 10.9 x 9 Inches; xvi, 384 pages. Fair. Highlighting Item is intact, but may show shelf wear. Pages may include notes and highlighting. May or may not include supplemental or companion material. Access codes may or may not work. Connecting readers since 1972. Customer service is our top priority. Good. Item may show signs of shelf wear. Pages may include limited notes and highlighting. May include supplemental or companion materials if applicable. Access codes may or may not work. Connecting readers since 1972. Customer service is our top priority. A used book in good condition. All pages are intact, and the spine and cover are also intact. Fine. 189257800X LARGE BOOK. Like new condition. Good. Large crease on front cover. Binding is tight. Clean pages. No notes, highlighting, underlining. Satisfaction guaranteed. I can't tell you how great this book is. Bill is like being taught by my grandfather who I loved beyond words. He see so much and teaches so much about the real nature of a horse. He knows his stuff and this book is written just like he talked, which I loved. If you real want to know how to train your horse this is the book.